Would love to see some pics of progress on this production. Here or Lotus IG, perhaps. Congratulations. I got word that my alumilite Lekhak is on the way. Glad yours turned out so well. Edited by EDC, 26 July 2018 - 22:34. Form submitted for one if each size. My first Group buy! My first buy. So...will I be contacted for payment and details? Thanks! Alumilite Lotus Lekhak Broad nib. There's a whole universe of color in the material. A very substantial pen! Edited by steve50, 31 July 2018 - 23:11. My Lotus Vikrant in Turquoise Brown Lava Lamp (Aluminite) just arrived. When I first ordered it I was a little hesitant as I don't really see brown and blue going together well. Now that I hold it in my hand I see how gorgeous the combination can be. It is a very beautiful pen and I don't regret my purchase at all. Hello, could you please share how the metal threads are integrated into the body? 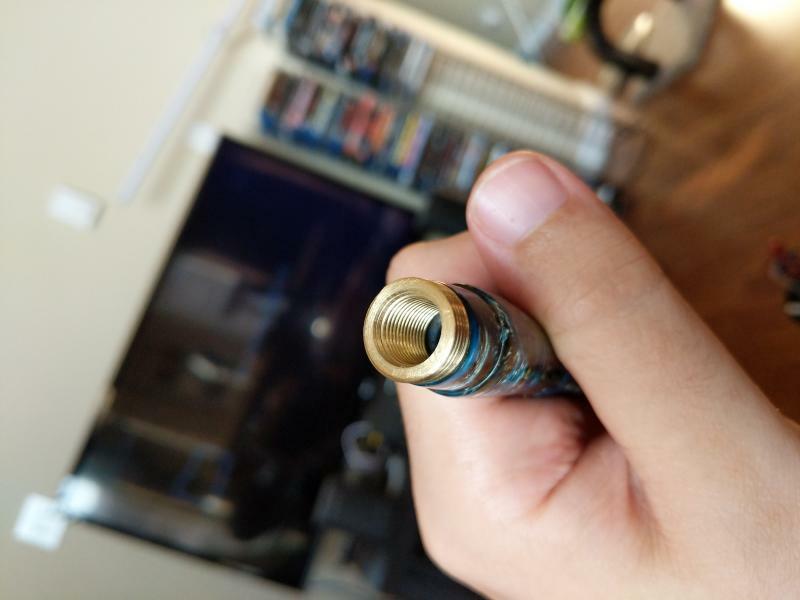 Is it a metal overlay on the acrylic body, or are the inner threads also made of metal? Thanks, that clears up my curiosity. Got my blue mono acrylic Vikrant last week. It is a very pretty pen.. 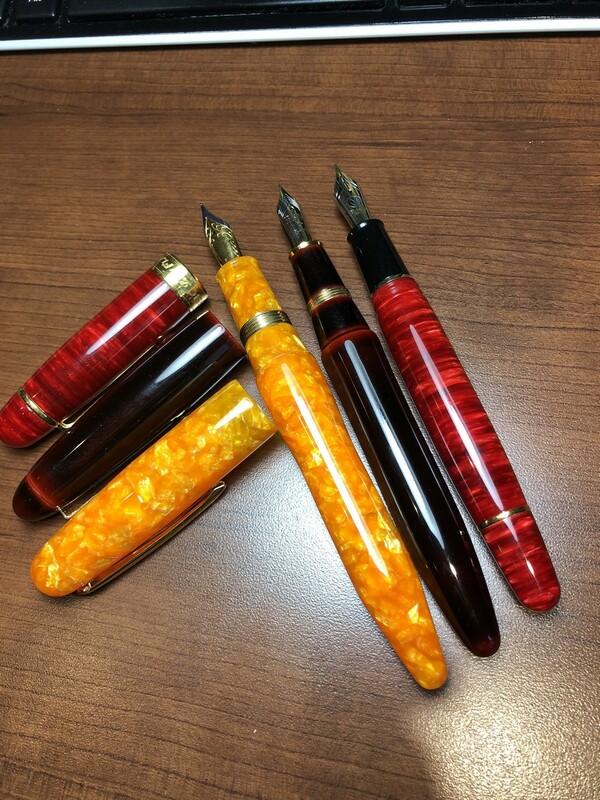 Immediately contacted Lotus pens and placed an order for a red one as well. Loved the material, finish, comfort, weight and everything else about the pen.. Below are some snaps of the pen. That blue plastic is looking great. Am waiting for a couple of Lotus pens too. It's surprising how underrated these are... Folks you can't go wrong with them. Just got mine today in the super-bright Orange Crush acrylic. Wonderful quality. Writes superb. I'm asking them now about another. I love the shape, but I would refer something with maybe an 11mm or 12mm section. This one might be a tad big, but we will see as I correspond to them. 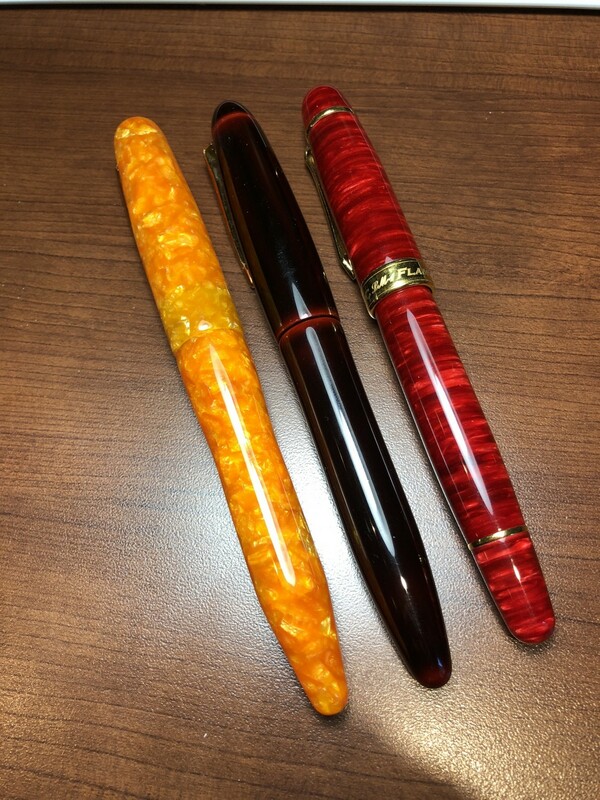 Here is mine next to a Classic Pens Flame Red LM1 and a Platinum Izumo Tamenuri, but of which are similar in size/shape to the Lotus pens. They both just happened to be filled this week.